iAdopt for the Holidays is now in full swing, which means we’re asking you to consider giving a homeless animal a loving home. PLUS during the campaign period, all cats and kittens at Ontario SPCA animal centres are available for adoption for only $99 and you’ll receive a free box of Arm & Hammer® clumping cat litter while supplies last! Already have an adopted pet? Enter the iAdopt contest for a chance to WIN free pet food for a year from Royal Canin! Visit iadopt.ca for contest details. The campaign to build the Ontario SPCA Provincial Dog Rehabilitation Centre is now underway! This one-of-a-kind facility will fill a critical gap in current services by addressing the special needs of dogs most difficult to adopt. The Provincial Dog Rehabilitation Centre will be built on Peterborough Humane Society’s lush new 20-acre property, giving dogs a fresh start with lots of opportunities to enjoy the outdoors. Designed from the ground up for dogs who require extra care and attention, the building will feature an abundance of natural light to promote healing and a layout that incorporates the latest research and best practices in animal centre management. Take a few minutes to learn about this campaign in our Animals’ Voice Pawdcast. This holiday season, we’re excited to introduce Judy as the newest plush in our Rocky & Friends collection. Like the other Friends, Judy is created in the image of a very real animal who got a second chance because of caring and kind people like you who support the Ontario SPCA. At the Ontario SPCA, Judy and her six siblings were put in the loving care of a temporary foster home to be nurtured until they were old enough to be adopted. This black Shepherd-Labrador mix and her siblings were all adopted and are very happy in their new forever homes. 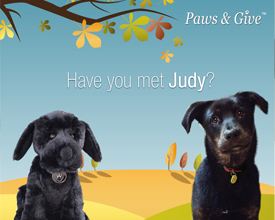 When you give this plush toy as a gift, you will be helping to rescue other dogs like Judy. 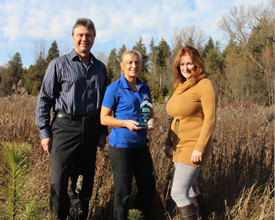 The Ontario SPCA is honoured to be the recipient of a stewardship award from Ontario Streams for our continued support of their efforts to protect streams and reforestation. Ontario Streams is a non-profit environmental organization dedicated to the conservation and rehabilitation of streams and wetlands. Through our partnership, Ontario Streams has planted 2,400 trees at the Ontario SPCA Provincial Office and Provincial Education & Animal Centre, located just outside Newmarket. In areas such as York Region that are experiencing high urban growth, maintaining tree cover and natural green spaces can be a challenge. The increase in impermeable surfaces caused by the paving of roads and development of subdivisions interferes with the natural hydrology of a watershed, and inevitably results in water quality and quantity issues and loss of pristine aquatic and terrestrial habitat. The Ontario SPCA recognizes that a healthy environment is essential for the health and well being of our community, including our four-legged friends. Thank you to Ontario Streams for recognizing our commitment! Still searching for the perfect gift for that animal lover on your holiday list? We’ve got you covered! Shop Paws & Give™, the Ontario SPCA’s virtual giving catalogue, from the comfort of your home and find the purr-fect gift for the animal lover on your holiday list. 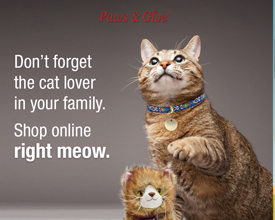 Watch for our Paws & Give Cyber Monday special on Nov. 28 and save. Have you ordered your dog advent calendar yet? Advent calendars for dogs are the newest addition to Paws & Give™, the Ontario SPCA’s virtual giving catalogue. Include your dog in the holiday festivities with a special treat once a day all the way to Christmas. They’re going fast, so order yours today!